From green walls you can munch on to a mountain of fruit and vegetables, many of them grown by local gardeners, these exhibits will have pride of place at this year's Community Garden Festival. The event celebrates the passion and skills of Singapore gardeners, and this year, the spotlight is on edibles, with displays and workshops centred on plants we can eat. The three-day National Parks Board's (NParks) festival at HortPark, along Alexandra Road, will run from today till Sunday. 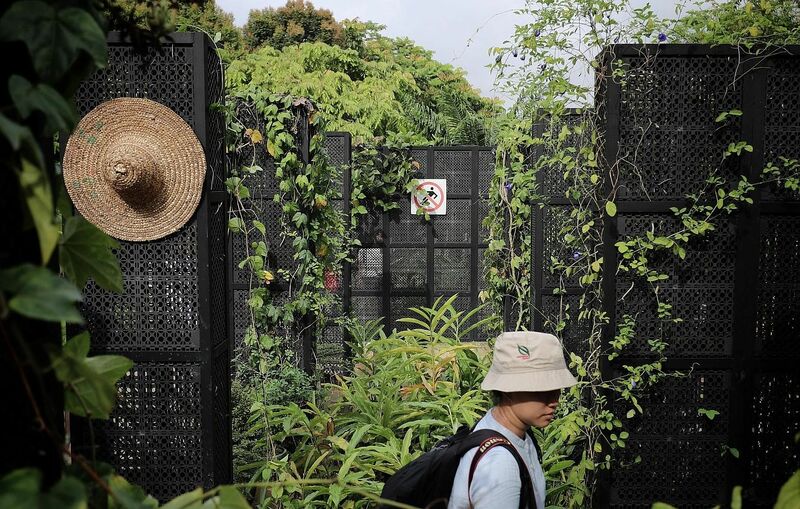 Festival director Dennis Lim said this year's theme of edible plants relates to the increasingly health-conscious Singapore public. It also features the shared passion and bond between the community gardeners who took part in this year's festival. Entry to the festival and the activities are free, except for a number of payable workshops. The festival is the work of more than 100 gardeners under NParks' Community In Bloom (CIB) initiative, which brings together people with a passion for gardening. Growing truffles might seem an impossible feat in Singapore, but Dr Salem Shamekh of Juva Truffle Centre in Finland wants to prove naysayers wrong. He will be holding a workshop on how to grow the plant at home. A species of white truffle was discovered in Thailand. It is a big possibility that the plant can successfully thrive in Singapore, Dr Salem said. There will be five garden displays: 2065; Play Mosaic; Block 50; Talk Bird, Sing Song; and Balik Kampung. The 2065 display celebrates Singapore's past 50 years of gardening, and hopes to inspire visitors for the next 50. It adopts a futuristic theme, showcasing mushrooms in multi-tiered raised planters and mushroom-cultivating towers, as well as plants in recycled plastic bottles that were repainted by community gardeners. 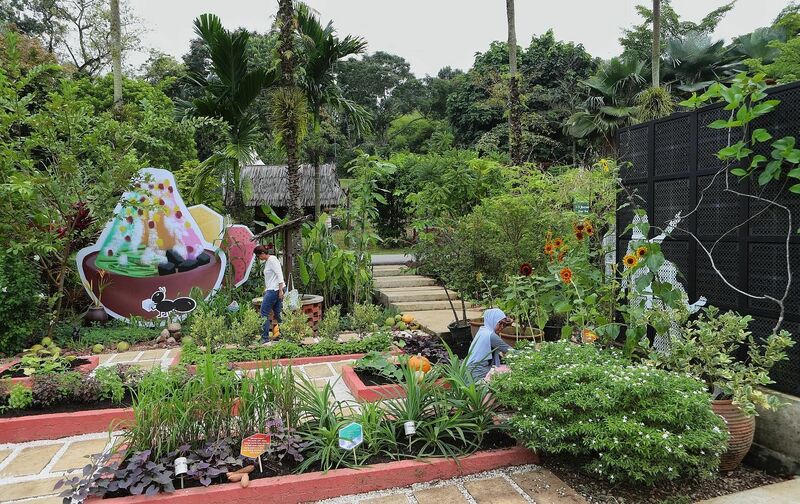 Mr Lim Keng Tiong, a 75-year-old retired contractor, helped build the 2065 garden display with other gardeners from Singapore's North-East District. A gardener for more than 10 years, and an NParks CIB Ambassador since 2013, Mr Lim said: "We put in a lot of hard work. But when you see the result, it's so worth it. I want nothing more than to see the smiles on people's faces - especially young kids' faces." The festival will also feature landscaped gardens by two local designers and a Japanese designer . There will also be an innovation and technology showcase, talks and family-friendly activities on all three days, along with cooking demonstrations and the payable workshops tomorrow and on Sunday. Truffle fans can look forward to a free workshop on Sunday on how to grow the plant in Singapore. Visitors can also buy plants - such as orchids, small plants with fleshy leaves called succulents, and even rare ones like the ice plant - gardening tools and accessories at a retail MarketPlace. Winners of the Community Garden Edibles Competition, featuring some of the biggest and freshest fruits and vegetables grown by local community gardeners, will be announced today.